Featured. Simply Jessie Photography in the press! We have been delighted to have been noticed by the grand ole interwebs the last two months. Check out below where we've been!The fabulous Elizabeth Anne Designs ! Introduced to a new Midwest Blog, Middle of the Map Weddings with sweet Emily Walters! This lovely little post also made the front page of Wedding Gawker. This site is an online gallery of eye candy with new things daily! Another wintery engagement session on Landlocked Bride ! 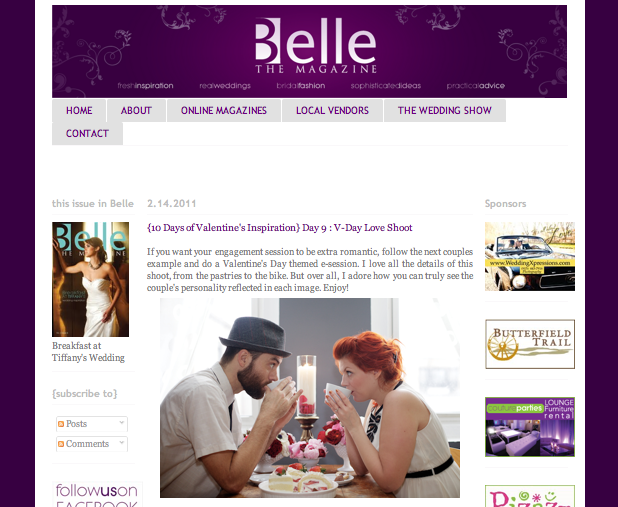 Our Valentine's shoot with Leanne and Gordon made the rounds all over the Web. Two more reposts! We worked with the wonderful Kelly of Fleur for florals and the lovely cross stitches with Ruggles Stitch. One at Middle of the Map Weddings. And here too on Belle the Magazine!